The Department of Art, Graphic Design and Art History and the College Arts & Sciences Outreach. The Department of Art, Graphic Design and Art History offers a Summer Art Academy through A& S Outreach. 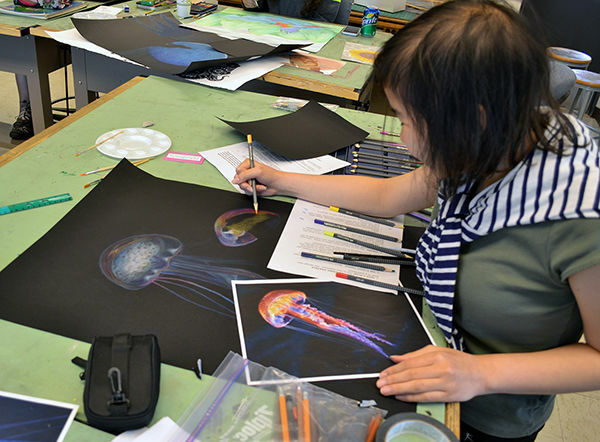 Enrolled students experience high quality noncredit art instruction. Students attend pre-collegiate classes that provide them with an opportunity to experience and apply some of the same concepts and design principles delivered during college lecture and studio art programs. This takes place under the supervision and instruction of master instructors, all of whom are full time faculty at OSU. Class size is small, and classes are held outside the normal school year. As school budgets face funding cuts, and other subjects vie for student attention, students often have to sacrifice an interest in art in order to pursue other subjects during the school year. This type of Art Academy allows students to continue to explore creative directions.Students experience college-like instruction, and more importantly, discover valuable career options and degree paths possible with the Visual Arts. Last year, we found many interested students were unable to attend the Summer Art Academy due to financial constraints. There were no program registration waivers available to help defray expenses. We are determined to change this, but we need your help! We have applied for grants, and we’ve already dropped the registration fees.However, even the lowered registration cost is beyond what some students can afford. We can’t lower the registration fee any further without sacrificing materials or the time needed to make real change. We need your help! Together, with your support, we can show area students we believe in their ability to transform their lives and make great art. Help us show them we believe art is important, and that a summer art experience can establish a foundation for a future in art. DONATE: Any contributions get us closer to our goal. SHARE: Spread the word about this program to your friends and family. Share the information about our progress! Your contribution to this Oklahoma State University PhilanthroPete project will be managed and receipted through the OSU Foundation, a 501(c)(3) organization. Contributions are fully tax deductible unless otherwise indicated in the project rewards section. Shout out on social media thanking you for your generous support of our Philanthropete campaign! Following camp completion, we will send you a link to a video with photos highlighting the students at work, and a gallery of their completed projects, along with a Thank you! Join the students for a day! Pick a day to audit a course of your choice! See your gift in action! A personalized thank you letter from the tuition waiver scholarship student funded by your generous gift. Audit one day of the Summer Art Academy to see your gift at work! Thank you for making a difference in a student's life!